A sharp cold front is passing through the Midwest this Sunday afternoon. Gusty winds and much cooler temperatures will accompany the front. Numerous locations in Nebraska recorded a 50-60 degree 24 hour temperature change, near 80 to near 20! While the change will not be this drastic everywhere, it will begin to feel like winter yet again. 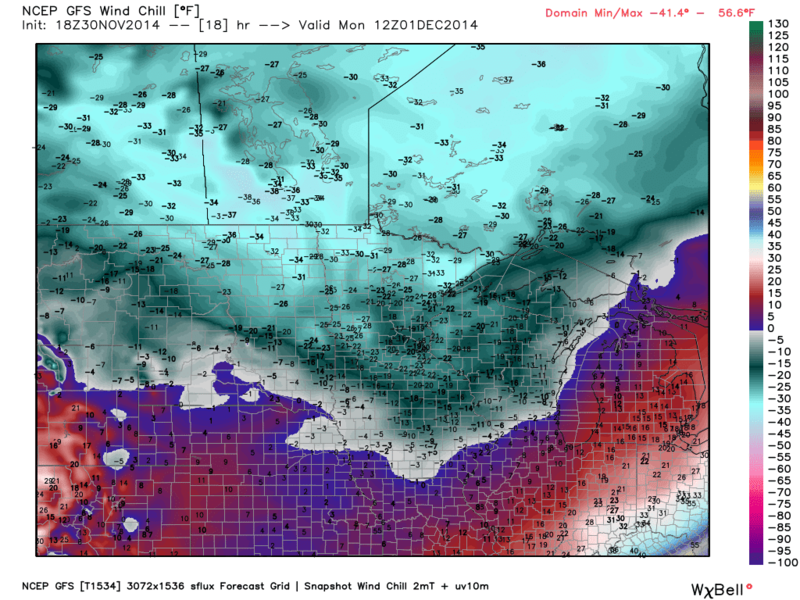 Wind chills will range from 20-40 below zero in the hardest hit locations Monday. The map on the left shows the GFS model projection of wind chills Monday morning. Wind chill advisories (light blue) and wind chill warnings (darker blue) encompass much of the upper Midwest. Much of the winter weather headlines last into Monday. Winds shift to a more southerly component Tuesday, as warmer weather will return! Temperatures appear to be at or above normal for the next week after Monday and beyond. For those that hate the cold, just make it through Monday. That is all for now, be sure to check back for future winter weather updates.